Artisan-inspired brewers, chefs and bartenders have created a unique food and beverage scene in Asheville, North Carolina. Only a few decades back, Asheville, North Carolina, was best known as a quiet mountain haven for artists, craftspeople and off-the-grid types. But as happens with charming locales, the secret got out. With the city named in countless “best of” magazine roundups, the tourism industry here has ballooned. Though it’s still a small town, Asheville’s year-round population of only 80,000 swells to a quarter-million in the fall, which is the region’s high season. Many of those visitors are beer aficionados. In the past two decades, Asheville has become a Southern mecca of craft beer that’s now home to more than 20 breweries and has thrice been voted “BeerCity USA” in an online poll sponsored by American Craft Beer Week. The city’s long-established “buy local” ethos has invigorated the relatively young scene, and the Asheville Brewers Alliance keeps a spirit of mutual support and education strong among its members. The dining scene—a bastion of locally sourced cuisine—has thrived apace with the brewing industry, and the energy in both has sparked new avenues of creativity in recent years. 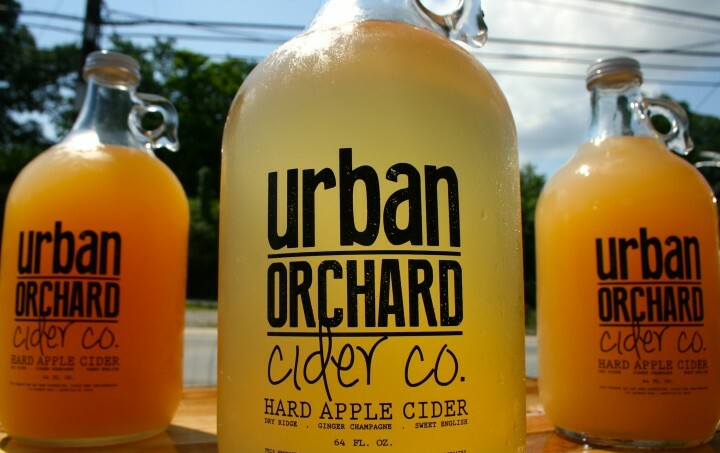 “People here are pretty educated about alcohol trends, particularly when it comes to craft,” says Jeff Anderson, marketing and creative director at the year-old Urban Orchard Cider Co. If beer is still the biggest draw for drinkers in this cozy Appalachian town, the future is full of promise for innovation and growth. Asheville has a laid-back vibe and a mountain water supply, so it’s no surprise that those who are drawn to alchemize with hops, malt and water have found the area hospitable for brewing. Many on the beverage scene credit Oscar Wong, who founded Highland Brewing Co. in 1994, with setting the stage for the generation of craft brewers that have put the city on beer enthusiasts’ radar. “He’s the reason we have the beer scene that we do in Asheville,” says Kevin Schwartz, a sommelier and owner of the store Divine Wine & Beer and the former assistant food and beverage director at the local resort Grove Park Inn. Highland, which opened a new brewing facility and taproom in 2010, is still unique among Western North Carolina brewers in that it currently distributes to nine states and Washington, D.C.
Several Colorado brewers have recently staked terrain in this area: Sierra Nevada Brewing Co. and Oskar Blues Brewery have opened second production facilities here, and New Belgium Brewing Co.’s new brewery is slated to begin production in late 2015. The Asheville Brewers Alliance welcomed the bigger guys “with open arms, and we aren’t afraid of competition,” Schwartz says. He points to the Appalachian spirit of helping one’s neighbor in an effort for a greater good. “Chefs and bartenders are cheering for each other and working together. You don’t see that everywhere,” he adds. Asheville Independent Restaurants (AIR) has upwards of 120 members, and there are plans in the works to organize a similar group for bartenders. The food scene in turn rallies for local brewers: Many restaurants here proudly devote most, if not all, of their beer menus to Western North Carolina brands, and Ashevillians and tourists have a wealth of options for both on- and off-premise beer sales. The Thirsty Monk, an Asheville landmark that has added three more locations in recent years, is repeatedly ranked among the world’s best beer bars and serves a vast, constantly rotating selection of world and American craft beers on tap and in bottles ($3 a 12-ounce bottle to $95 a 3-liter bottle). On the other end of downtown, the all-beer retailer Bruisin’ Ales stocks more than 1,000 beers, ciders and meads from around the world ($2 a 12-ounce bottle to $325 a 9-liter bottle). A few blocks from the main tourist drags, Green Man Brewery, Hi-Wire Brewing, Twin Leaf Brewery and Asheville Brewing Co. have set up taprooms in a light industrial area that’s known as the South Slope. On the edge of that budding brewers’ district sits Wicked Weed Brewing, which became the first Asheville brewery to win a gold medal from the Great American Beer Festival in 2013. With 28 beers on tap, Wicked Weed pushes experimentation in a big way, toying with wild yeasts, citrus and barrel aging. “We’re always challenging ourselves to try new techniques and write new recipes,” says head of brewing operations Walt Dickinson, who opened the brewpub in 2011 with his brother, Luke, and three partners. Dry, hop-heavy brews are well-represented at Wicked Weed, including the Freak of Nature Double IPA ($5.25 a 16-ounce pour) and the Tyrant Double Red ($5.25), which was awarded a bronze medal from the 2014 World Beer Cup. Sour beers, inspired by Belgian lambics, are another Wicked Weed specialty: The brewpub’s flagship, Black Angel Cherry Sour ($5.75 a 10-ounce pour), is brewed with sweet and tart cherries and aged in Bourbon barrels. In coming months, Wicked Weed will open an off-site barrel aging facility, dubbed “The Funkatorium,” to expand its sour beer and Bourbon barrel-aged ale programs. “We want to be on the front edge of the craft beer market, and sour beer is that right now,” Dickinson says. Asheville’s bar leaders point to the robust dining scene as the engine for its swiftly evolving drinks culture. 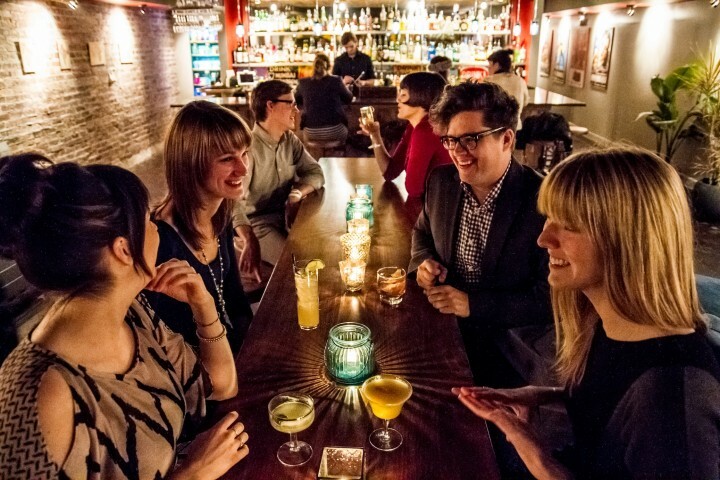 Several restaurateurs have opened new bars that emphasize creative cocktails. 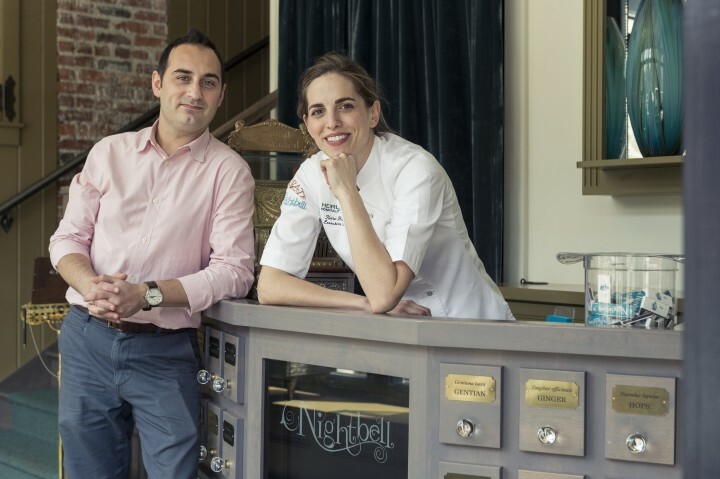 Launched in 2013, Nightbell is a speakeasy-inspired concept from acclaimed chef Katie Button and her husband, Félix Meana, who first brought national buzz to Asheville’s food scene with their traditional Spanish tapas bar Cúrate. Nightbell showcases Button’s talents and training in molecular gastronomy through drinks and desserts that offer surprising twists on standards. The Hemingway Sorbet ($14), for example, makes a Daiquiri spoonable rather than sippable by combining Wray & Nephew white overproof rum, Luxardo Maraschino liqueur, grapefruit juice, lime juice and liquid nitrogen, while a Dark & Stormy ($10) takes a spot on the dessert list as a frozen cocktail layered with Don Q rum, ginger beer, roasted pineapple, grilled lime, five spice, mint and a Sailor Jerry rum float. 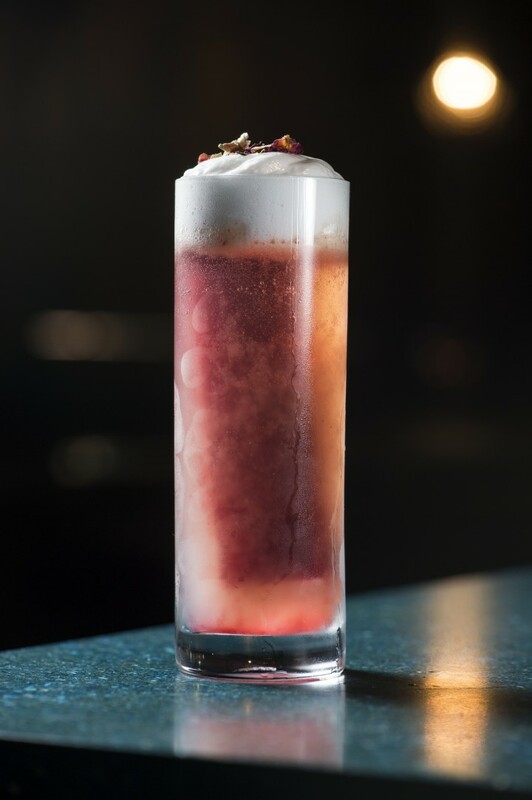 A best-seller is the Cold Roses ($11), comprising rose-infused Tito’s Handmade vodka, St. Germain elderflower liqueur, lemon juice, soda, lavender foam, and an ice cube made from a purée of blackberries, raspberries and strawberries. James Beard-nominated chef Jacob Sessoms owns Table, a farm-to-table concept often credited with pioneering Asheville’s fine dining scene in 2005. In 2012, he added bar and lounge The Imperial Life, located upstairs from the restaurant. The venue’s focus is on fine cocktails, lesser-known wine varietals and local beers. Downstairs from his popular Indian street-food spot Chai Pani, owner Meherwan Irani opened MG Road in 2012. Its program features Indian-inspired drinks, such as the Grand Trunk Road ($10), made with Batavia Arrack van Oosten, Cana Brava rum, green tea, lime juice, soda, nutmeg and kudampuli—an Indian spice sometimes called fish tamarind. “The idea wasn’t to Indianize drinks, but to make amazing drinks with a far wider pantry of ingredients than bartenders usually have access to,” Irani says. MG Road also hosts weekly dinner pop-ups with their own food menus, décor changes and specialty cocktails. “Punk Wok” is an Asian-inspired collaboration with local chef Elliot Moss, while “Girls on Deck” is entirely female-run. “We wanted a bar where you never take the environment for granted,” Irani says. Divine Wine & Beer stocks wines made in North Carolina. Despite the new additions, North Carolina’s iron grip on spirits sales has made Asheville a tough market for innovation. 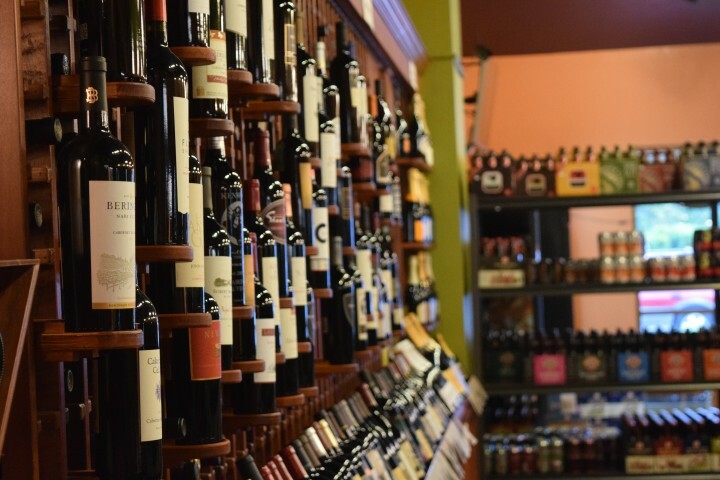 Spirits are heavily regulated: Even bars and restaurants must purchase from Alcohol Beverage Control (ABC) stores overseen by the State ABC Commission; there are no deliveries. The state’s approved selection of products is highly limited, and any product not on that list must be ordered by the case—a real impediment to building extensive libraries. “They’re beginning to make some exceptions, but we still have a lot of difficulty accessing many harder-to-find items,” Schwartz says. To the same end, Nightbell’s menu indicates where each cocktail falls on a spectrum from straightforward to complex and from refreshing to boozy. He also offers every wine on the list by the glass. “I like to educate people and let them try something that’s different and unique,” he says. Education is also a big theme at Divine Wine & Beer, where Schwartz holds frequent classes in food pairing and beer, cider and wine mixology, along with regular beer and wine tastings. Since opening his store, he’s noticed that beer moves faster than wine among his customers and is expanding the section already. Top-sellers include Victory Brewing Co.’s Prima Pils ($9.99 a six-pack) and North Coast Brewing Co.’s Scrimshaw Pilsner ($10.99). Schwartz also features a small section of North Carolina wines, noting that North Carolina was the largest wine producer in the nation before Prohibition. Those vines were replaced by tobacco. Now the reverse is happening. “This state will never be a place where you can grow great vines and make great wine, but you can have good—and sometimes really good—wine,” he says. “So one of my missions is to reintroduce North Carolina wines to my customers and get them to take a fresh look at them.” Carolina Heritage Vineyard & Winery’s Chambourcin and Chambourcin-Cynthiana Blend do well in the shop ($12.99 and $13.99 a 750-ml. bottle, respectively). Schwartz asks local winemakers to suggest North Carolina cheeses that pair best with each wine. Alongside craft brewers, cocktail artisans and local vineyards, other beverage-makers are bringing products to market in a big way in Asheville. Blue Kudzu Sake Co., opened in 2013, is one of only seven sake breweries, or kuras, in the United States, with a staff that boasts three certified sake professionals educated by sake expert John Gauntner. Four flagship sakes are made on-site, and Blue Kudzu recently began bottling its Spirit of the Sky junmai ginjo, which has a dryness and minerality similar to a white wine. With an abundance of orchards in Western North Carolina and access to high-quality, fresh-pressed apple juice, it’s perhaps less surprising that a handful of hard cider companies have popped up in the past few years, with more coming down the pike. These modern cideries are taking a cue from the beer scene and, in some cases, expanding customers’ ideas of what cider can be.